A smaller, more lightweight version of the classic RipStik that makes it easier for younger children to balance and learn how to ride. The RipStik Ripster is a smaller, lighter version of the original RipStik made for younger kids to make it easier for them to learn how to balance and ride. Recommended for young children ages six to twelve to help them with the basics of riding and help them get the hang of it faster so they can be less frustrated and have more fun! A smaller version of the original RipStik Caster Board, the RipStik Ripster is smaller and lighter for younger children to use. This is the recommended size for children ages six to twelve that will help them learn to ride faster and easier. To ride the RipStik, kids need to put one foot on the board and push off. This is usually the hardest part. Then, once they get moving, they need to use a swaying body motion to keep themselves on the board and keep the board moving. 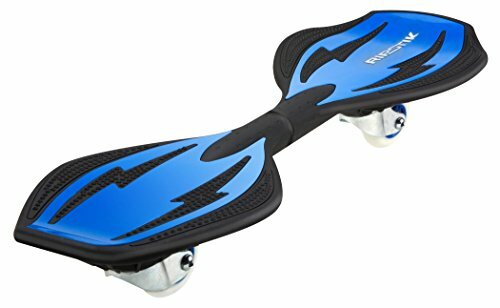 To get off the RipStik and stop the board, the child can just take one foot off and put it on the ground, and then stop the board with their other foot. The Ripstik Ripster is still the same, original RipStik, just smaller. This smaller size allows for younger children to ride, and it makes it easier for them. The Ripster fits kids as young as six years old. Users have said that it makes riding a lot more enjoyable for younger children because it takes less time for them to learn how to ride, and it’s not as difficult because it’s a smaller size specifically made for younger kids. It’s also lighter, making it easier for children to carry it and make it move faster. Riding on the RipStik helps kids work on their balancing skills; there are only two wheels on either side, so at first, it can be hard to keep your balance. However, once you get the hang of it, it’s pretty easy. It is made of very durable plastic, and has been said to last over several years, even with kids that use it every single day. Because of the common issue with balance, safety gear is highly recommended for new riders. Razor even offers helmets and pads that match the Ripster. Users have complained that it takes a while to learn, and it does. There is a lot of coordination involved, and so kids just need to practice to get the hang of it. It can be dangerous if you don’t know how to ride it, so that is why wearing a helmet and knee and elbow pads are recommended. Kids who ride it right away and don’t wear any protection can get injured. Some reviewers have said their children have broken bones from riding, and the goal of the protective gear is to prevent injury. After a lot of use, the wheels can wear out. Razor now sells replacement wheels that can be put on the Ripstik if they do wear out. To prevent the wheels from wearing out and to prevent an injury of any kind, we recommend keeping the RipStik on a flat ground, specifically concrete, to ensure safety and the best quality of riding. It’s going to get dirty since it will be outside. To wash, either take a damp cloth and wipe the RipStik down or use a hose with cold water to wash off any dirt. The board is made of all plastic and the wheels are made of good quality urethane that are designed to last the rider for several years. There have been several reports of kids breaking arms and elbows from falling off the RipStik. To prevent injuries like these, we recommend purchasing a helmet, knee, and elbow pads for protection for children who are just learning to ride. All children, even if they do know how to ride, should wear a helmet, but knee and elbow pads are a suggestion for kids who are new to the RipStik.